Nowadays most of the garments, be it a shirt, a pant, a blouse, a jacket or even jeans, we can always find fusing in it and often I get to hear this question on how to make a proper fusing as the types of fabric, base cloth never remains the same. And to know that, first of all, we need to know about the basic of fusing technology, the importance of it, the fusing parameters that control fusing quality and t the fusing process. Fusing is an alternative process of fabric joining which is widely used to attach interlinings. The fusible interlining consists of a base cloth, which may be similar to that used for a sew-in interlining, but will carry on its surface a thermoplastic resin in the form of dots, which will melt when heated to a specific temperature and pressure and flow into the fabric to make the bond. Fusing has a classic application in the clothing industry for sticking together two pieces of fabric. It can also be used in the automotive industry and furniture industry for applying foams, knitted spacers or nonwoven to leathers. It helps in shortening manufacturing time with a consequent reduction in direct labour cost along with the better look and feel which was not possible in sew-in laminates. What are the basic fusing parameters? There should always be a consistent amount of pressure throughout the interlining and the outer cloth for full contact between them. This will ensure a correct transfer of heat to the glue-line along with even penetration of resin among the fiber of outer fabric. If the pressure is too high, it will result in strike-back and strike-through, and if the pressure is too low there would not be proper penetration and thus lower adhesion. The type of resin used. The type of substrate being used. The nature of the outer fabric and the base cloth being used. Cooling is done so that the fused assemblies can be handled immediately after fusing. It can be done by passing the fused laminate through water-cooled plates, compressed air circulations and vacuum. The first three factors are interrelated with each other and any change in one will result in changing the other parameters also provided a limit to the extent to which one factor will compensate for the other. Basically, the fusing process requires the elements of fusing i.e. temperature and pressure applied over a particular period of time inside a specialised fusing press. With the rise in temperature at the ‘glue line’ by the electric heating elements of the press, the resin changes its state from a dry solid to a viscous fluid. And only now with the application of pressure, the resin in its molten state would flow among the fibres of the outer fabric and the fusible base cloth, adhering to it. On cooling, the resin re-solidifies in its place forming a durable bond between the two components of the laminate. A minimum amount of time is required for the heat to pass through the fabric and activate the resin which would vary accordingly with the type of the fabric and the resin used. After the fusing is finished it is then cooled down rapidly for handling. About the Author: Soumyadeep Saha is a graduate in Apparel Production and is currently pursuing his Master degree in Fashion Technology from NIFT, New Delhi. His area of interest in Quality Assurance and writing content. 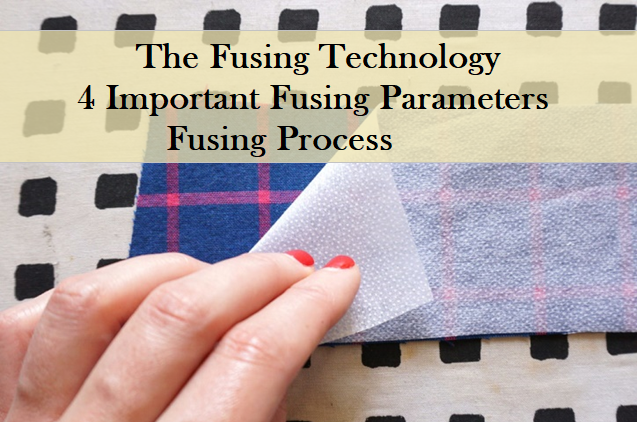 The fusing technology in garment manufacturing, all that you need to know about fusing process, fusing parameters, importance of fusing are discussed here.